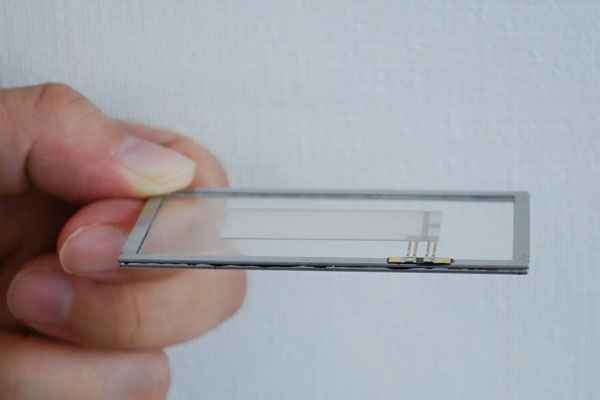 Kyocera Corporation has just revealed that it has developed an ultra-thin, lightweight audio device, called “Smart Sonic Sound.” A medium-size model has a thickness of 1mm and weight of 7g. The new device takes lessons from the company’s long history of pioneering fine ceramic technology and utilizes a piezoelectric actuator combined with a special film to create a piezo film speaker. Smart Sonic Sound will not only contribute to making digital devices even thinner — such as flat-screen TVs, PCs and tablets — but also enhances audio quality for a much more realistic audio experience. Its low directivity characteristics broaden the sound projection range, providing 180-degree sound quality and bringing delicate and minute sounds to life. This innovative piezo actuator audio technology is being utilized in a flat-screen television for the first time by LG Electronics in its new 55” curved-screen 55EA9800 OLED TV. Smart Sonic Sound comes in three different sizes (large, medium and small), and Kyocera plans to expand its use in a broad range of applications including digital devices and automotive applications with strict weight requirements. This is the second audio innovation from Kyocera in recent years. The company launched the award-winning Smart Sonic Receiver in early 2012, revolutionizing how sounds are heard exclusively on Kyocera mobile phones for the Japan and U.S. markets. Smart Sonic Receiver uses a ceramic actuator to send vibrations via tissue conduction and traditional air conduction through display screens without the need for a traditional earpiece or loudspeaker, making it ideal for clear audio in exceptionally noisy environments. The new Smart Sonic Sound technology uses the same base technology but with a different implementation that amplifies air conduction.